The Birth of The Octochord – ACRONYM Inc. In the wake of Rock ‘n’ Roll’s initial explosion at the end of the 1950s, American kids got the message very quickly: pick up a guitar, grab some friends, and start a band. This compulsion was so prevalent in the US that an entire genre of music – Garage Rock – developed, and kids from Tacoma Washington to the wilds of Florida found common ground when they all tried to learn “Louie Louie” and play at their friend’s backyard party. Now that the children of post-WWII families were starting to come of age, and the Viet Nam war was only just getting started, the combination of better education, more leisure time created a demand for entertainment to fill both leisure and radio air time. It also helped that rock and roll was, compared to the music of their parents, fairly easy to play. You could figure out how to strum a song from a record with a little patience and some beer, unlike the popular music of their parent’s generation, which required practice and study. Rock and Roll was closer to the metal, and the distance between you and a song was developing a good Pete Townsend windmill and being able to play “Psychotic Reaction” on demand. 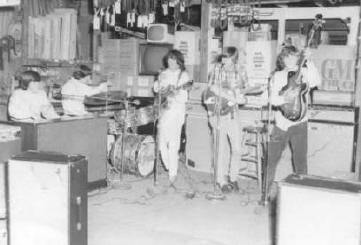 The Garage Rock movement was unique in that it was fractured. The majority of Garage Bands never recorded, and even fewer played regular gigs. The scene was spread across the country, but due to the newness of rock journalism, the slim number of outlets that were interested in Rock Music, and the fact that the touring circuit was not yet carved in stone, each region had their own unique take on Garage that was largely unaware of what was happening elsewhere. The scene in Texas wasn’t grooving on records from Massachusetts, and vice versa. Garage Bands were only seeing releases on regional labels, often in small runs of 100 or less, if a recording was even possible. These bands didn’t always write original tunes, making their bread and butter in covers and playing local dances or shows at a VFW hall. After the Pat Boone-ification of rock music, garage became the line that was drawn across generations. The period between 1960 and 1965 saw an unbelievable uptick in these kinds of bands, all united by a love of Music and a belief that jamming on a riff with your buddies was the only sensible way to spend an afternoon. By 1965 a number of changes – culturally and musically – were beginning to take hold. Music was beginning to mutate again, political and social tension was coming to a head, and in a post-Kennedy Assassination world, it as difficult to imagine the naiveté of the early ’60s continuing for much longer. The beginnings of a musical political consciousness was starting to awaken, and you could no longer play a sort of primitive frat rock and be taken seriously. Enter Ron Dillman, a newspaper writer covering the music beat for the Orlando Sentinel. Ron knew the score, and followed the local scene pretty closely, in spite of his square dress and stupid hat. Ron was at all the shows, and was always supportive of new acts. Ron was noticing the changes, how the bubble gum of the last few years wasn’t sticking anymore. It was the perfect name – We The People – a populist slogan that communicated you were a dove, but in a strange in a psychedelic way, like The United States of America. Ron was on the cusp of a modal shift, and he knew that the right gimmick could bag him a few hit records. He just needed a band. It was serendipity when Ron showed up at a Trademarks show to hear that it was their last show with Ralphie, their drummer, an account that he didn’t own his own set, and was never available to do road gigs because he couldn’t get the time off from work. Ron instantly thought of The Offbeats, who just lost their singer / songwriter to another band, and were looking to keep the act together. He realized that they were both sort of chasing the same idea, but from different angles, and that they might complement each other better than either of them thought. The Trademarks featured really fuzzy guitars and harmonicas as part of their sound, while The Offbeats had a member – Wayne Proctor – who played a thing they called “the octochord,” which sort of sounded like a sitar. This octochord was homemade by a family friend, and might just work with the sound everyone else was developing. Ron’s philosophy was: throw everything at the wall, and see what sticks. Ron introduced the bands to each other at a local watering hole, where they all talked shop for three hours, running over gear and records. Ron went on to sell the band on his name (We The People), mentioning that he could get them a record deal (maybe) if they used it, and that it would be a hit, guaranteed (lie) if they just tried it out. The band dug what Ron had to say, and before long they were jamming out future hits like “You Burn Me Up And Down” and “Into The Past.” Ron ran into a streak of luck when he successfully managed to get someone from Hotline Records to drop by a rehearsal, who immediately agreed to put out “My Brother, the Man” in 1966. To everyone’s surprise, it was a top 10 regional hit in Florida. Ron couldn’t believe it. He was doing everything he could imagine to get We The People off the ground, and in a strange turn of events, it was starting to work. Challenge Records caught wind the group, and struck a deal to release three 45s to follow up the success. Challenge had lucky with “Tequila” by The Champs, and with records by Jan & Dean and The Knickerbockers among their releases, it seemed a little strange to be making a foray into psychedelic garage. But Challenge was taking a lot of chances in those days, as they were doing rather poorly, and were looking anywhere for a hit like “Tequila” to give them the money they needed to continue. Bands like We The People benefited from Challenge’s risky behavior, and before long their follow up, “Mirror of Your Mind” was getting airplay as far north as Nashville. The band released two more singles in fairly rapid succession, and while they were generally liked, only the B-Side to their last release with Challenge hit #2 in the region, keeping them on the radio for a while but never bringing them to a national audience. Challenge stopped offering We The People deals, and soon the label folded. Ron quickly made the calls to get the band on RCA Records for a three single deal. However, Wayne Proctor, one of the primary songwriters, suddenly quit. He was dodging the draft, using college as his “out,” but this meant he couldn’t be associated with a socialist rock band in order to make the argument fly. In spite of the loss, their RCA Singles did okay, and hit the local airwaves, unfortunately to tepid success. When Tommy Talton left after their last 45 failed to make it big, it seemed like the end for the band. Ron made a few last ditch efforts to course correct with the remaining members. But the writing on the wall was clear; this band now only existed “Into The Past.” Ron tried desperately to keep the band alive, and sunk every last dollar into promoting and renting a venue for a Halloween 1970 show. After an endless number of phone calls to replace last minute members dropping out, he managed to get some form of We The People to finish playing 10 songs in capes that evening, the bare minimum needed to count as a full set and not get called out for ripping off the audience. After that night Ron realized that managing the band no longer has the spark it once did, and dissolved We The People, paying out the remaining members with his own money, leaving him in the hole for years to come. What We The People left behind is more than some bands ever get to do. 14 songs recorded in a studio, and a story that is so set in a time and a place as to sound like a joke from my parent’s generation. But their sound was pretty mind blowing, and prefigured punk in a number of ways. But if Lee de Forest and the other mavericks that helped pioneer radio had a band manager analog, it would have to be Ron Dillman, manager of We The People. He had a vision, an idea, and the tenacity to do it, in spite having no real idea how the music industry really worked. Sure, he did not succeed; Ron wanted a hit, and Lee wanted to be The Father of Radio. What neither of their realized was that their efforts in the past have left an indelible mark on the present, and to those who want to follow the story, their reward is something that sounds like it could have happened to them if the circumstances were just a little different. Tribute Post In Honor of The Passing of Celebrity Starr, Who Was Incredibly Important To Me.